Encore! Mt. 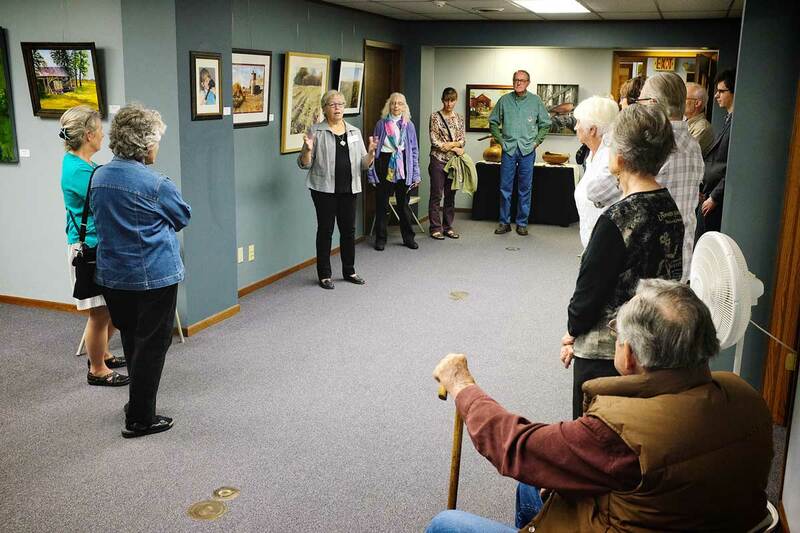 Morris hosted its opening night of the “Art in the Country”, Saturday, September 8th in the Old Sandstone Gallery. Fifteen artists entered up to three pieces each around the rural theme. Several awards were given for the most outstanding entries. 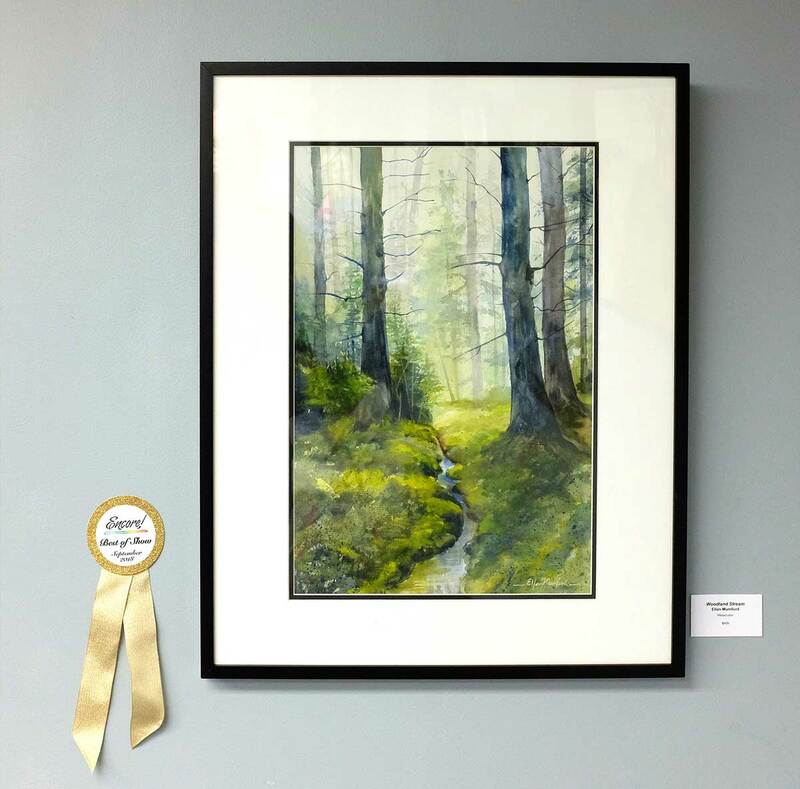 Ellen Mumford, Dixon, received the Best of Show award for her watercolor “Woodland Stream.” Ellen also received one of the Judge’s Choice awards for her watercolor “Hershey Centennial Farm.” Bob Logsden, also of Dixon, won the other Judge’s Choice for his photograph “Don’t Fence Me In.” Three additional Awards of Excellence were given for Becky Hundrieser’s (Grand Detour) “Tractor Seat,” Carol Bingham’s (Sycamore) “Snow Fall on the Church Road” and Sandra Weiland’s (Geneva) “”Old School.” A host of other fine pieces are also a part of the show. The gallery is open free of charge from 2:00-4:00pm Saturday afternoons in September. Most of the art pieces are available for sale and several of the artists have provided additional prints or paintings for sale, as well. This show is the final one of the season. Opening night in the Old Sandstone gallery Sept 8, 5-8pm including refreshments (cider and cider donut holes), opportunities to meet the artists for the “Art in the Country” new show, and gentle music. This show continues the September tradition of displaying a variety of fine art in several media. Many of the pieces are available for purchase, as well as additional prints supplied by the artists. In addition to opening night, the gallery will also be open on Saturday afternoons 2-4pm. Call for entries: Encore’s fourth gallery show of the 2018 season, this juried show invites original art of all kinds, with a rural or Midwest theme. Artists may submit 1-3 images of their original works for consideration. Accepted art works must be the same item(s) that are displayed in the show (no substitutions). Artists must be 18 years old or older. Only those images received by the deadline will be considered. Specifications for art pieces: 2D format: Maximum size: 48” x 48”; minimum framed size: 8 x 10”; weight: <40 pounds; frames: wired for hanging; no warped, dirty or damaged frames please. 3D format: Contact us with your questions about very large works. Awards and publicity: Jurors will select the art pieces for this show, and award prizes. Awards of Excellence will be given in several categories. Encore! Mt. Morris reserves the right to photograph all exhibited work for publicity purposes. Sales: Art works may be available for sale during the exhibition. Please note that Encore! Mt. Morris retains a 30% commission on all art sales to cover Gallery expenses. Prices may not be changed after submission. Payment for sold art work will be issued 30 days after the close of the exhibition. •	Complete the Artist Application online below. •	Images should be <2 MB each, no smaller than 1024 pixels on the longest side, 72 ppi/dpi (standard web resolution), and show no frame or mat. •	Pay the entry fee for the number of images you are submitting: Fees can be charged online through PayPal including credit cards. The non-refundable entry fee is $25 (1 image of art piece), $30 (2 images), or $35 (3 images) and must be paid at the time of the application. If you prefer not paying the fee online, you may send a check to Village Hall, 105 W. Lincoln St, Mt. Morris IL 61054. Make the check out to Mt. Morris Economic Development Group with “Encore Art in the Country” on the memo line. Insurance and Liability: Every care will be taken to safeguard all work shown under Encore! Mt. Morris’s sponsorship, including a gallery host on the premises whenever the gallery is open. However, all persons submitting artwork for the exhibition are encouraged to maintain their own insurance on their works. Encore! Mt. Morris maintains general liability only, which covers the art in case of major incidents such as fire, theft or sprinkling system failure. August 2-8: Jury selection of art works announced via email to all artists. September 30: Pickup of unsold work. Any work not picked up within 10 days after will become the property of Encore! Mt. Morris. Attach JPEG-only images of the 1-3 art pieces you wish to have considered for the show. •	Specifications for 2D art works: Maximum frame size: 48” x 48”; minimum frame size: 8 x 10”; weight: <40 pounds; frame: wired for hanging (No other types of hangers allowed); no warped, dirty or damaged frames please. •	Specifications for 3D art works: Contact us with your questions about very large works. •	Payment of entry fee, required at time of entry. * Verification Please type the number in blue. If registering from a phone or pad, you may not be able to attach the image files. If you prefer: Please send the files via email to September2018@EncoreMtMorris.com (include your name in the subject line). When finished filling out the above information, please click 'Submit' below. You should receive a confirming email very shortly after registering. Mt. Morris Economic Development Corp.
All applications and payments must be prior to the August 1st deadline.